the Mines of the Future. 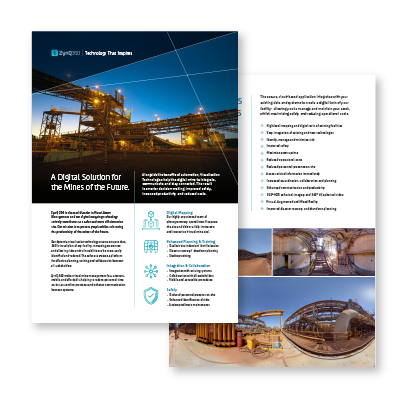 Alongside the benefits of automation, Visualisation Technologies help the digital mine to integrate, communicate and stay connected. The result is smarter decision-making, improved safety, increased productivity and reduced costs. ZynQ 360 is the world leader in Visual Asset Management and our digital mapping technology actively contributes to a safer and more efficient mine site. Our mission is to protect people whilst enhancing the productivity of the mines of the future. Our dynamic, visualisation technology creates an up to date, 360°, virtual plan of any facility, increasing awareness and allowing risks and vulnerabilities to be more easily identified and reduced. The software creates a platform for effective planning, training and collaboration between all stakeholders. ZynQ 360 makes visual mine management fast, accurate, mobile and affordable, helping to reduce personnel time on site, streamline processes and enhance communication between systems.